Harrisburg Police Detective Kirk Aldridge was in a deep sleep when he got the call about a shooting, which occurred about 2:30 a.m. on Nov. 25, a Saturday. Jahsun (JAH-son) Patton had been a defensive back on the Boys’ Latin of Philadelphia Charter School team the season before. He was visiting his sister in Harrisburg to celebrate his acceptance into college when he was shot and killed. He was 18. Jocelyn Smith Lee, a University of North Carolina-Greensboro professor who studies how losing loved ones to violence shapes the well-being of black males, says that with big moments like anniversaries, it’s important to do what she refers to as “calling out the process.” In the case of Boys’ Latin, that meant openly recognizing how the loss of Patton altered the team. It’s important, she said, given the messaging to be macho that boys often receive growing up, which can make it harder for them to work out their feelings. 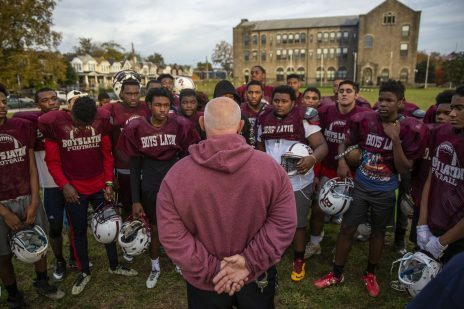 His loss has had an impact that spilled into this year’s football season for the school — in large part because of the effort made by Patton’s mother (Maxayn Gooden) and coach (Anthony Pastore) to make sure the teenagers understand the impact of gun violence, and to keep Patton’s death from being merely a number in Philadelphia, where at least 28 other teenagers were shot to death in 2017.